Jack Black to be exact, but all my friends call me Jack! My mom said you were coming! She said you wanted to share poetry??? Umm, I don't know too much about poetry. But I would be happy to take you for a ride! We could go to the dog park! So you can throw it again. My mom said that this used to be her rock garden. Emphasis on the garden part. You don't want to do that either? I guess we will have to try that poetry stuff! She'll round them up throughout the day. By the way, I actually am a very literate dog! My mom reads poetry to me all of the time! I've taught a long time. More than half my life. Almost 30 years. Last week, however, I did something I have never done before. I helped close a school. Not just for the summer. I've done that lots of times. This time, I helped close a school for good. Forever. The school where I worked this year is being turned into a charter school. About 18 months ago, the district decided, for whatever reason, that the school was not meeting kids' needs, and would be converted to a charter school. Last fall, they converted the primary wing. This fall, they will convert the intermediate wing. I was in a somewhat unique situation. Unlike most teachers, who had worked there for five, ten, or even twenty years, I was only at the school for one year. I knew I was only going to be there for one year. I didn't have tons and tons and tons of stuff. Basically, all I had was my personal items- pictures of my boys, the rocking chair where I sit for read aloud, and, my books. My books. The staple of my life as a teacher. Picture books. Nonfiction. Poetry. Chapter books- both stand alone and series. Forty-five boxes of books, to be exact. The kids left on Friday at 1:30. Most of the other stuff- district curriculum, math manipulatives, computers and document cameras-had been removed, one thing at a time, throughout that last week. As one of those teachers who usually teaches until the bitter end, and then takes down the room after the kids are gone, it was actually kind of strange for me to have things start disappearing before the week was over, but that was how the process had been organized, and so pretty much everything else was gone. And all that was there, on Friday afternoon, was just the books and me. By that time, my generally somewhat neatly organized classroom library was everywhere. About one third of the books were still in bins on shelves in the library area. Another third were in open boxes spread across the floor in our class meeting area. And the final third--the books that had been in kids' book bags, the books that had been borrowed by colleagues, the books that had been used in different areas of the room, were stacked in piles anywhere and everywhere where there was room for a pile. I looked around at those piles and piles of books, and wondered how I was ever going to be out of the building by today at four, which is when the charter school is scheduled to take over the building. I envisioned leaving everything. Fleeing to Mexico. Or just making mad sweeps off the counter and sorting everything out next fall at my new building. I wanted to cry. But then my book club arrived. Karen. Brenna. Laura. My home gals. The women who have been my friends almost as long as I have been a teacher. They know me well. Know I am the total disorganization goddess of the world. Know my nonlinear, non sequential, non organizational personality. Know that I have difficulty pulling off anything linear and sequential, like a move. 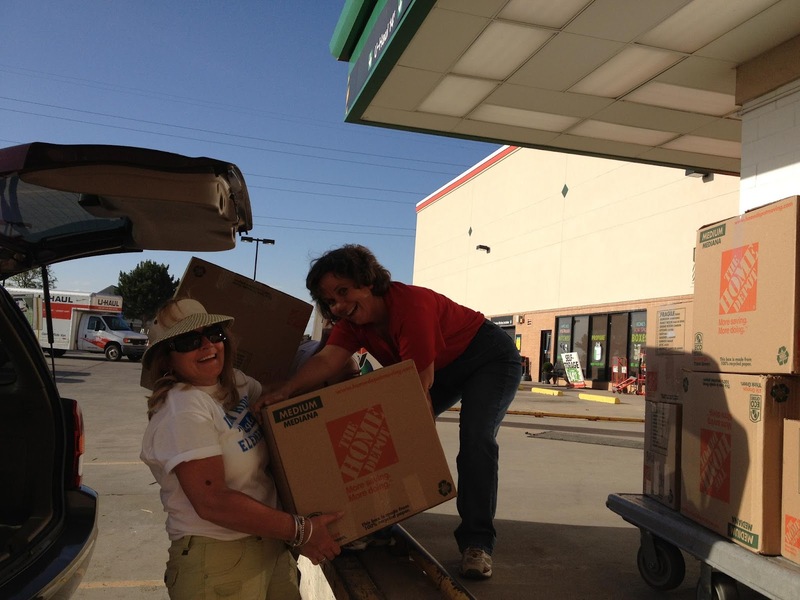 And so they showed up to help. Laura, ever the hospitality goddess, with a cooler full of water and ice. Brenna, a true organizational goddess, with a plan for how we would get things into boxes and out of the school. And Karen, fresh off of field day with her own second graders, just there, as she has been a hundred, or maybe a million other times when I have needed her. And within minutes, everything was organized. Brenna made boxes. Laura sorted piles and piles and piles of books by author and category. Karen taped boxes and took down the few remaining bulletin boards. Together the three of them figured out that I would need a storage locker. And sent me to procure said locker while they made boxes, and packed, and taped some more. By the time I got back from the storage locker, the books were all in boxes. The boxes were labelled and taped shut. The cars were lined up outside, ready to be loaded. And so, within three hours, 45 boxes of books were packed, loaded, and unpacked into a storage locker without incident (well, ok, there was the unfortunate incident in two unnamed book club members forgot how old they were and attempted to turn a storage cart into a surfboard, but only minor injuries were incurred), and we were sitting a local eating establishment, sharing adult beverages. Today is our official last day. I have to clean out my desk and check out. But then I will spend the rest of the day helping my teammates pack. Because not everyone has a book club like mine. 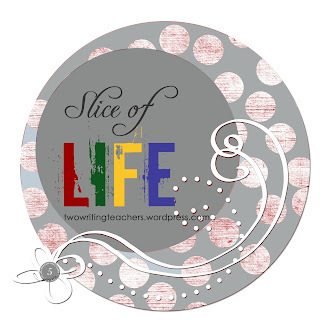 I've been away from blogging for a couple of weeks. 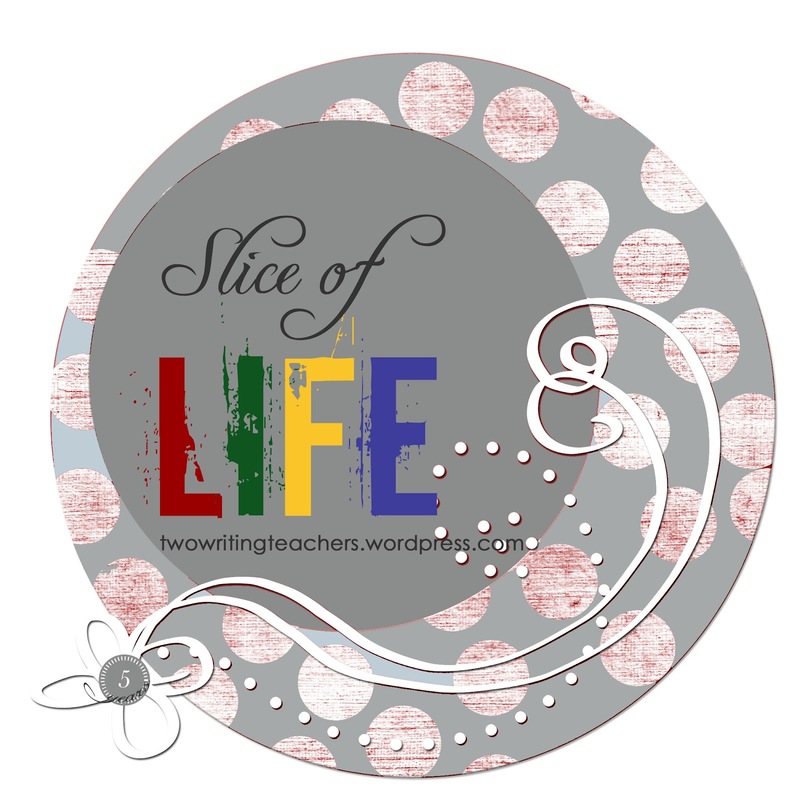 Busy with prom and graduation on the home front, and publishing final projects, completing report cards, and packing up a classroom on the school front. Decided to start my summer bookaday with a picture book that's been waiting almost a month to be reviewed. 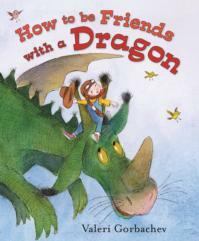 HOW TO BE FRIENDS WITH A DRAGON by Valerie Gorbachev is a perfect book for re-entering the world of kidlitosphere. A really sweet book about friendship with a little bit of a surprise at the end. Perfect for initiating a discussion about friendship during the first few weeks of school, or just sharing in a "Friends" basket in a primary grade classroom. I could also see using it as a mentor text for "list books" or specificity in an third or fourth grade classroom. And it's time to enjoy the view. I googled "Poems- Stillness" and came across this website. Lots of really great poems. Mild in a blue bowl. The yellow linoleum. Katya is hosting Poetry Friday. And I promise I will so get back to that pretty soon. But I couldn't stand not to share this picture. You want to see one more?? Well, OK, if you insist! I have prayed, but the gods would not heed. That the weak and the timid call Chance. Next Wednesday, my son graduates from high school. For some, graduation is a time of banquets and award ceremonies, honors and accolades. For others, it's simply a time for, "Phew! We made it!" Recently, I have been thinking a lot about my son's journey. He has not loved high school (or elementary or middle school for that matter). He does not like sitting still. He does not like listening to other people talk. He does not like talking himself. His is a world of doing, not words. He went to school mostly because you have to go to school to play football. And that boy loves, loves, loves his football. And now he is finishing. It has not always been pretty. and doing what he had to do. Irene Latham is hosting Poetry Friday. Semper gumby. Semper gumby. 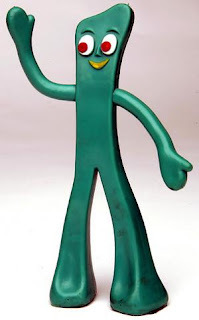 Semper gumby. That's been my motto for the last few years, and even more so for the last few months. Take tonight, or more specifically, the conversation I just finished with Son #1, who might, it seems, actually graduate from high school. I have just finished a grueling Monday. At work at 6:30 am, DRA testing, indoor recess, after school math club, (during which I negotiated a credit card payment for Son #2's tux for prom). Tonight, I did two hours of final editing of Chris Van Allsburg author study pamphlets, then about 9:45 decided to head off to bed. The boys were in Son #2's bedroom watching a movie. "Night boys, I love you." Son #1 opens the bedroom door. I think it is the longest I have seen him all day. I decide I should take advantage of the opportunity. "How's school, buddy? Do you need anything from me?" I am thinking about help finishing a paper, completing a math assignment, etc. Ok. Two days ago, he absolutely was not going to prom. Not with a girl, not with his friends, not at all. And not to the after prom at the school either. "Are you going to prom?" "Are you going with a girl?" I ask. "Yes." Emphatic. He is more than a little offended that I would ask such a stupid question. Maybe he knows I will ask who the girl is, because the next answer comes before I ask the question. "China." Ok, a girl I know. A pretty nice girl actually. The manager of the football team. "Do you need to buy tickets to prom?" "Can you find out?" Then I remember the announcement about prom tickets was in last week's parent newsletter. I pull up the information "$45." "You want me to write a check?" Inwardly I wonder how I went from no one going to prom, zero dollars, a week ago, to two children going to prom, at a cost which seems to somehow be rapidly moving toward $1000, including tux, meals, flowers, new clothes for after prom, etc. (and we are not even doing any of the over the top stuff like limousines!). "Do you need a tux?" "When are you going to do that?" "Umm, when can we do it?" "How about tomorrow after school? We can go after I get off work." "China wanted to go with me." "OK, so you don't want me to go?" (Evidently taking your prom date to pick out the tux is the new trend-or new since I was in high school anyway, because Son #2 also went with his date to pick out tuxes). "No, China wanted to go. Will you give me some money?" Um. Sure. No problem. I always have $200 in my purse at 10:00 on a Monday night. "You can do it the way your brother did it. You go pick it, then call and they give me a confirmation number, and I will call it in and pay for it." "OK. Where do I go do it?" I hope his brother might explain a little about the process, directions, etc. But son #2 is involved in his movie. "Just google it," he shouts through the bedroom door. I get online and google the tux place, then try to figure out a couple of landmarks. (Aside from the football field, my boys have remarkable locational deficiencies. Son #2, who can find an open receiver on a football field crawling with 21 other large moving bodies cannot, for the life of him, find the ketchup bottle in the refrigerator, and Son #1 can find a six inch hole to squeeze through on a football field, but can't find his way to the grocery store we have gone to for the past three years without directions). I find a map of the tux place, then bang on the bedroom door again. "Here are the directions to the tux place. It's about halfway between Kinko's and Sears where you picked me up when I had the flat tire on 2nd. Think you can find it?" I think I should try the school thing one more time. "Hey Zay, you know grades are due on Wednesday. Are you good? Do you need anything?" "Naw, I'm good," he says. "OK, boys, good night. I love you." If you came over from TEACH MENTOR TEXTS, please know that I am having technical difficulties today. I have no idea why, but Mr. Linky is taking everyone to a post that is six weeks old. I actually have a new post about reading I have done this week. You can follow that link or cut and paste below. Sorry about the mix up. I think I read a fair amount. 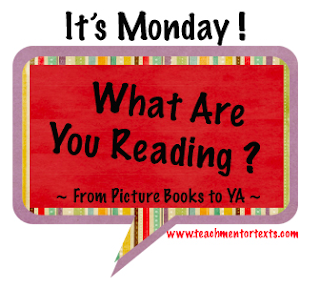 Or at least I think I read a fair amount until I read everyone else's IT'S MONDAY, WHAT ARE YOU READING posts at TEACH MENTOR TEXTS. 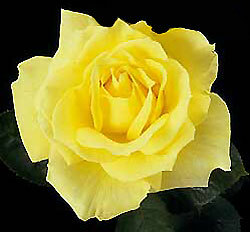 Which, if I am really honest, tend to make me feel totally discouraged. Because I think I have had a pretty good reading week if I have read at least one novel. And some people read one a day! Holy cow! In the summer I get more read, but in the winter, I just kind of plod along. Anyway, here is what I read this week. Anne Lamott has been one of my favorite memoir authors for many years, starting with OPERATING INSTRUCTIONS, then TRAVELING MERCIES, and PLAN B. (I don't like her fiction nearly as much). OPERATING INSTRUCTIONS, the first Lamott novel that I read is about Lamott's first year as a single mom. In SOME ASSEMBLY REQUIRED, Lamott's son, Sam, who was the baby in OPERATING INSTRUCTIONS, is now nineteen, and has a son of his own. 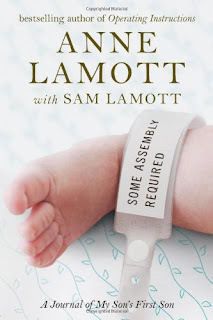 ASSEMBLY chronicles Lamott's first year as a grandmother. SOME ASSEMBLY REQUIRED came out a month or so ago, so when I got a gift certificate to Barnes and Noble, I knew exactly what book I wanted to buy. Most of Lamott's memoir books are shortish, stand alone chapters, which I tend to get through pretty quickly. This one is actually sequential, and it's taking me a little longer I'm about three-fourths of the way through the book right now. I will probably post about the book when I finish it later this week. I also read GLORY BE, a middle grade historical fiction novel about life in the segregated south during the Civil Rights movement. I posted about that yesterday. Next, I am planning to read PENNIES FROM HEAVEN by Jennifer Holm and DEAD END IN NORVELT. I got all three of those at the Scholastic Warehouse Sale on Saturday. Glorianna (Glory) Hemphill is like most other eleven, almost twelve-year-olds that have just started their summer vacation. She's looking forward to spending hot summer days at the pool with her best friend, Franklin, and under the semi (ok, maybe not so much) watchful eye of her older sister, Jesslyn, who used to be her best friend, but has recently become interested in boys and the pep squad. Glory's plans change, however, when the pool mysteriously closes because some cracks need to be repaired. Actually, there are no cracks, instead, the town council has closed the pool because a group of civil rights activists has arrived and wants to help blacks integrate public places, including the pool. To prevent this integration from occurring, the town council simply closes the Hanging Moss Pool. Glory finds herself more than a little confused. Franklin has been her best friend forever, but his father, a member of the town council, and his older brother, J.T., a high school football star, are both strongly opposed to integration, and Frankie sides with them, and begins saying and doing things that put their friendship in question. 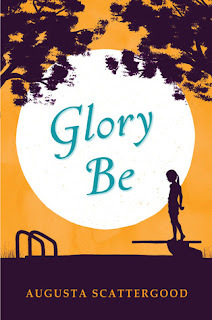 Glory's family, on the other hand-- her minister father, Jesslyn, and Emma, the maid who has raised the girls since their mother's death-- are all in favor of integration, as is Miss Bloom, the town librarian, who is another good friend to Glory. Miss Bloom introduces Glory to Laura Lampert, a girl who has come to spend the summer in town so that her mother can work as a nurse in a medical clinic for poor blacks. Laura doesn't seem to understand the "Whites Only" water fountain, or many other rules of Glory's very segregated southern town. Laura's actions, as well as those of Jesslyn's new boyfriend, another northern transplant, cause Glory to reconsider many of her own actions and beliefs. It's May. My son is a senior in high school. Last day for the top fifteen kids' grades. Pick up your cap and gown. Pay for extra tickets so your family can come celebrate. so he can be valedictorian. to determine whether he will graduate. and why we never talk about the bottom 15 kids. I subscribe to Your Daily Poem. The poems the past couple of weeks have been so perfect. Here are a few that I have loved. I wash, rinse, put it in the rack. A soft breeze passes from there to here. I'm always on the lookout, then, for new fairy/folk tales to share with my kids, and yes, I absolutely do believe in reading fairy tales to ten-year-olds. They love them, especially ones with a little twist. 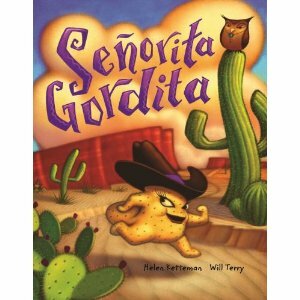 Today I will be reading aloud my latest find- Helen Ketteman's Señorita Gordita,, a southwest take off on THE GINGERBREAD BOY. (You might know some of Ketteman's name from BUBBA AND THE COWBOY PRINCE or THREE LITTLE GATORS). Señorita Gordita is a little corn cake (and yes, there is a recipe for corn cakes in the back of the book). One day, she hops out of the pan with a "flip and a skip and a zip-zoom-zip." And of course, because this is a fairy tale, there is a journey; this one happens to be across the desert. And of course, she encounters various desert creatures- a javelina, a rattlesnake and a tarantula. And of course, there is a smart and wily protagonist, who teaches Señorita Gordita a life lesson, "being zip zoom fast is good, but being smart is better." Will Terry illustrates Señorita Gordita. Terry's digital illustrations are detailed and richly colorful. I googled his work and was led to his blog. Terry has some really interesting posts on his digital illustration process and also on social media. Don't go there until you have a few minutes- I dragged myself away after half an hour! A great addition to your GINGERBREAD BOY basket. Perfect for Cinco de Mayo! Almost twenty years ago (or maybe yesterday? ), I had the privilege of studying with Don Graves in the doctoral program at the University of New Hampshire. I will never forget walking into Don's study for the first doctoral seminar. Don sat in a big swivel chair at his desk, laptop open. He pulled a piece of writing off the printer and said something like, "And so we begin…" With that, he passed out the first one pager of the semester. One pagers, it seemed, were a trademark feature of the UNH doctoral program. Every week, for pretty much every class, we wrote 1-1.5 page responses to our reading. And I know it doesn't sound like much, but sometimes, maybe most of the time, one pagers were really hard work for me. Don's class was on Tuesday, and I would often spend 8-10 hours on Sunday or Monday agonizing over what I was going to write (I was always a little shocked when I would talk to a classmate on Monday night at 9, and they still had not written their one pager for our Tuesday morning class- for me that would have meant pulling an all nighter!). Don believed that the one pagers were an opportunity for people to process and distill their thinking before they came to class. He commented one time that he thought that our class discussions were at a much higher level because we had written before we were allowed to talk. Often class opened with Don sharing his writing, and then we would break into small groups or partners and share ours. What shocked me the most about one pagers, however, was that all of the professors- Don, Tom Newkirk, Jane Hansen- wrote right along with us. They truly believed that teachers should never ask students to do what they were not willing to do themselves. I have carried that big truth with me for the past twenty years. Teachers need to be writers. Teachers should never ask their students to do anything that they are not willing to do themselves. I've written with graduate students. I've written with first and second graders. And this year, I have written a heck of a lot with my fourth graders. Right now, for example, we are doing an integrated unit on renewable and nonrenewable energy sources. As one of last week's lessons, we were supposed to write poetry about fossil fuels. My kids have read and written tons of poetry this year. Several weeks ago, I read LOVE THAT DOG, and then HATE THAT CAT. I also introduced them to a new poetry book FORGIVE ME, I MEANT TO DO IT, by Gail Carson Levine, and since then, much of their writing seems to have taken on a William Carlos Williams flavor. He's not a poet I probably ever would have thought of sharing with them, but they could definitely have chosen much worse mentors. Then, for a reason totally unknown to me, they are especially interested in acrostic poems. I don't remember ever reading them an acrostic poem, or showing them how to write them, but they are all the rage. Last week, when we wrote notes for Secretaries' Day, many of them wrote acrostic poems. After I explained to them that you had to choose words that actually went with the topic, they actually turned out pretty well. So again, we will go with it. Anyway, as I was saying, last week the kids were supposed to write poems about fossil fuels. I decided I would write a couple also. One is a William Carlos Williams take off. The other is an acrostic. I opened our workshop by reading my two poems, then we did a shared reading of an article about fossil fuels. My ten-year-olds read with a pencil in hand, marking important phrases and ideas they wanted to include in their poems. Afterwards, they wrote alone or with partners- they weren't required to write William Carlos Williams or acrostic poems, but almost all of them did. Leaves its mark on Mother Earth, people. And here are a few of theirs. Other places are hot and dry. Need to be careful of the earth. I think Robert and Don Graves, hit the nail right on the head. So much does depend on me, not as a teacher, but as a teacher writer, sharing my work with my kids.